The 28th annual ACUA Holiday Food Drive will be held Dec. 3-14 on recycling days. The Atlantic County Utilities Authority Holiday Food Drive that kicked off on Monday, Dec. 3 will continue through Friday, Dec. 14. Atlantic County residents are urged to place non-perishable food items at the curb on their recycling collection day as part of the 28th annual food drive. ACUA recycling crews will collect the food in conjunction with regularly scheduled recycling pick-ups. The food drive gives residents an easy and convenient way to help the needy. All food collected through the Holiday Food Drive will be distributed through the Community FoodBank of New Jersey Southern Branch, which provides the donated food to more than 300 partner charities for distribution to those less fortunate throughout Atlantic, Cape May and Cumberland counties. These charities include emergency food pantries, homeless shelters, soup kitchens, and other charitable feeding programs. Most needed items are canned soups, meals in a can, peanut butter and jelly, canned tuna and other meats, and cereal. Do not include perishable or frozen items, or food in glass jars. “The need for food donations is so great. Many of our friends and neighbors are struggling,” ACUA President Rick Dovey said. In Community Food Bank’s southern branch service area, which includes Atlantic, Cape May and Cumberland counties, there are more than 200,000 people who rely on the food bank. “ACUA’s food drive provides an easy way for people to donate when they put their recycling out. There are so many people in need, we are intent on getting as many residents as possible to donate to this year’s effort,” Dovey said. Last year, residents donated 21,245 pounds of non-perishable food items. “Our goal is to exceed last year’s total and we are always encouraged by the generosity of Atlantic County residents,” Dovey said. 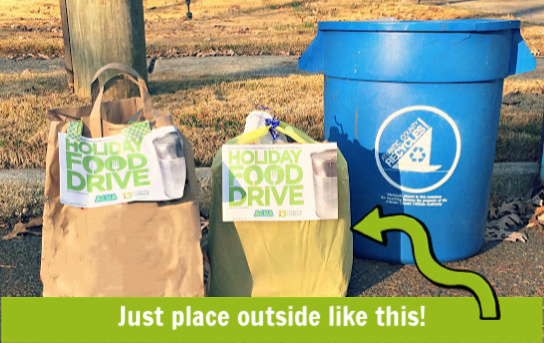 To participate, just fill any bag or box with your donation and leave at the curb on your recycling day between Dec. 3-14. Atlantic County residents not serviced through the ACUA curbside recycling program can participate by bringing their donations to the ACUA, 6700 Delilah Rd. in Egg Harbor Township or to the Community FoodBank of New Jersey Southern Branch at 6735 Horse Pike, Egg Harbor Township. For more, call 609-383-8843 or visit cfbnj.org/southernbranch, or call 609-272-6950 or visit acua.com/fooddrive.